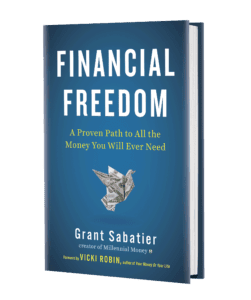 This strategy revolves around a simple but powerful mindset shift that personally transformed how I view money on a day-to-day basis. Now, whenever I compare two products or two prices, I always think about the percentage differences first, before the raw dollar amount. By looking at the percentage difference, it is easier to assess the actual savings or growth between two dollar amounts – resulting, when you use this to make decisions, in better decisions that lead to more savings and growth. Thinking in terms of percentages is also at the core of the 1% early retirement strategy. Of course, the more you save and the higher your investing percentage, the faster you can retire. In fact, 1% can actually make a massive difference and simply increasing your investing/savings rate by 1% can help you retire up to 2 years earlier. And if you push this further, saving 5% more when you are young, due to compounding, can result in retiring up to 10 years earlier. Would you save 5% more to retire or reach financial independence 10 years earlier? Uh, duh. If not, then this might not be the blog for you. ? It’s a simple fact that most people either aren’t saving anything or aren’t saving enough for retirement. 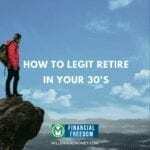 The popular and commonly held belief that as long as you save 5-10% of your income for retirement you will be fine, is completely false. When you do the simple math, saving 5-10% per year of a $50,000 salary likely won’t be enough to retire given the increase of inflation. You would have approximately $379,479 assuming an 8% contribution rate and average 6% compounding interest per year, which uses a simple 2.50% expected per year inflation increase, will only have approximately $180,000 of today’s purchasing power. If you want to learn more check out my post on how much money you should save. A lot of readers write to me and say they don’t make enough money to start investing or saving for retirement. While there are many early retirement calculators and strategies I recommend, including the $50 a day early retirement strategy, the 1% early retirement strategy is the easiest one to implement due to the simple fact that you can automate it and most people don’t feel any impact reducing their spending or increasing their savings by 1%. 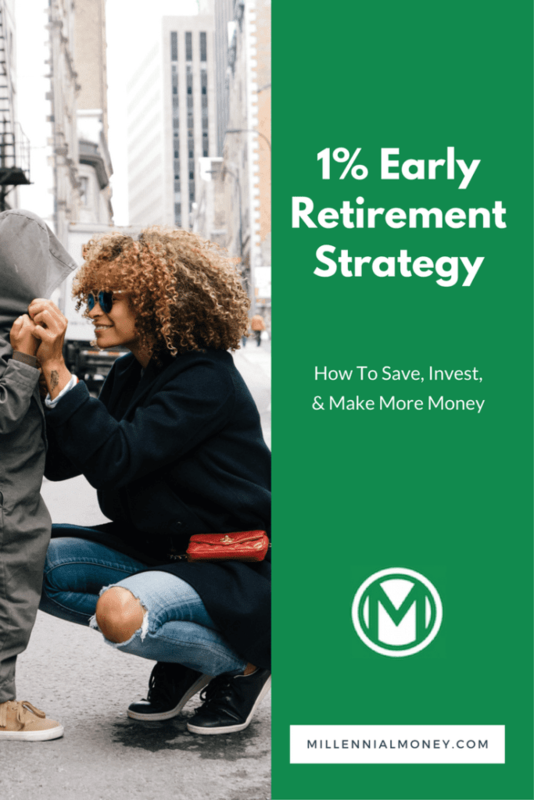 The 1% early retirement strategy uses the mindset shift of thinking about money in percentages, to help you save more money, make better purchase decisions, and make more money. Here are some guidelines to help you shift your mindset to save and make more money. The best amount to save is whatever you are comfortable saving. It shouldn’t take away from your day-to-day life, but you should push yourself. When I started saving it was 5% of my income and almost anyone can start there without feeling it. I also recommend saving immediately when you receive your paycheck. Saving first will help you spend the rest of your paycheck without guilt. When you know you have saved your target amount, it takes away some of the anxiety around money. No matter what percentage of your income or side hustle money you are saving, I recommend you try to escalate your savings percentage as frequently as you can. 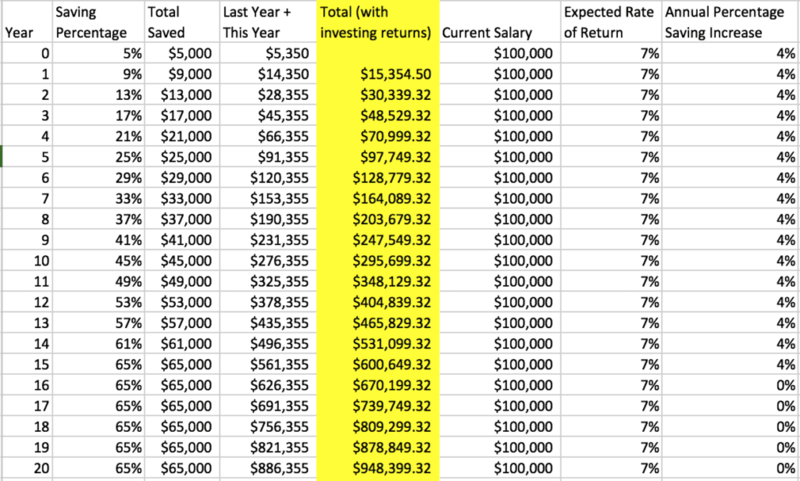 You can either automate or do this manually using your 401K, Roth IRA, or other investment accounts. A lot of 401k providers allow you to increase your savings rate in percentage intervals as frequently as you would like. You can also escalate your contributions manually, but doing it automatically is easier and you won’t even notice the difference in your paycheck. If you are starting with a 5% savings rate, then escalating your savings 1%, every 3 months you will be saving 25% of your income in 5 years. This is the easiest way to escalate your savings rate without feeling it. If you do start to feel it, scale back 1% and wait 6 months to try another escalation. Another tip, whenever you get a salary increase, reflect this increase in your savings percentage and escalate it, so your take home pays is the same pre-bonus. Investing your salary increases and bonuses can have a massive impact on your growth and help you reach early retirement. The next time you go to the grocery store, convenience store, or any store where a product is on sale, calculate the sale price as a percentage and don’t just rely on the dollar amount. When you are comparing multiple products, it also helps to calculate the percentage difference between the price. A simple example – compare the store brand of mouthwash at $3 to the name brand at $4. While a $1 difference in price might not seem like a lot, that’s a 25% savings, which is substantial. In fact, buying the store brand, in that case, is like making a 25% return on your money. That’s insane. When you take this approach and focus on the percentage difference between two products, it’s easier to make a value judgment on whether it’s worth paying more for one product. For me personally, a product needs to be A LOT better for me to pay 25% more. For most basic products, it’s not worth it. Mouthwash is mouthwash, right? I use the same strategy when I am trying to save money eating out and evaluate a restaurant’s menu to determine whether visiting a nicer restaurant is worth the often insane premium. There is a steakhouse that I really love in Chicago, the ambiance is next level, the apps and drinks are great, but I calculated that the steak costs almost 400% more than if I were to buy the same cut of meat at the grocery store. That’s an insane premium and since I did that calculation, I’ve definitely been making more steaks at home! Sometimes it’s worth it, but 400% is hard to swallow. When you compare purchase options as percentages and you make the cheaper choice, it’s immediately like make a percentage return on your money. 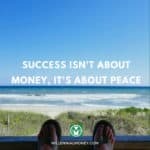 The easiest way to make money is to not spend it. When you remember to focus on the percentage difference between two products and make a value judgment on whether it’s worth paying more, in this case, 25% more for the brand name product. $1 is just a $1, but 25% is a ton. When you are figuring out how to make more money, focusing on percentages and linking your compensation to percentages in increased revenue, as opposed to a flat fee or salary, can make you a ton more money. This is one of the ways I’ve been able to make more money – the more revenue my digital marketing campaigns drive for clients, the more money I make. Too many consultants and employees leave money on the table. There are significant money-making opportunities when you negotiate what’s known as “revenue sharing” or a “revenue compensation deal.” The more money you make for your client or your company, the more money you make. The sky is the limit. I worked with one company who sold Bluetooth headsets and I set up and managed Google Adwords campaigns tied to their e-commerce cart, so I could directly attribute my campaigns to sales. I negotiated a 20% profit revenue share deal on my marketing efforts, so the more headsets I sold, the more money I made the client and myself. I was able to make $200,000 in 6 months spending about 5 hours a month working on the campaigns. It was a win-win. Many consultants or employees don’t consider this option, either because they don’t know it exists, they are afraid of the risk of not driving revenue, or they think their client won’t buy it. But in reality, sure you might not drive any revenue, but if you aren’t able to do that, then you probably won’t be providing much value to your client. Take the risk and reap the rewards. It’s also a no-brainer for your client to do it since they only pay you when they make money. It doesn’t hurt to ask. The same logic applies when you are figuring out how to get a raise, since your boss is unlikely to give you a salary increase over 5-20% of your current salary, no matter how well you make your case – unless of course, like the above example, you are able to attribute revenue increases to your work. So, if you are making $50,000 and you want to make $80,000, in reality, it will be very difficult to get a raise larger than $10,000 – $20,000 unless you have a made a significantly impact on the bottom line. Very few companies give raises more than 5%, so if you want to make substantially more money, it might take awhile at your current company. It’s also worth exploring opportunities for other forms of compensation like equity, more time off, or additional benefits. Any additional benefit actually has a monetary value you can calculate and factor into your decision-making. Over the past few years, I’ve turned into a total spreadsheet and calculator geek. 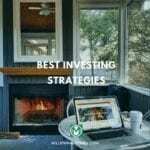 It’s bound to happen the deeper you dig into personal finance and using them to run different saving and investing scenarios will help you make better financial decisions. 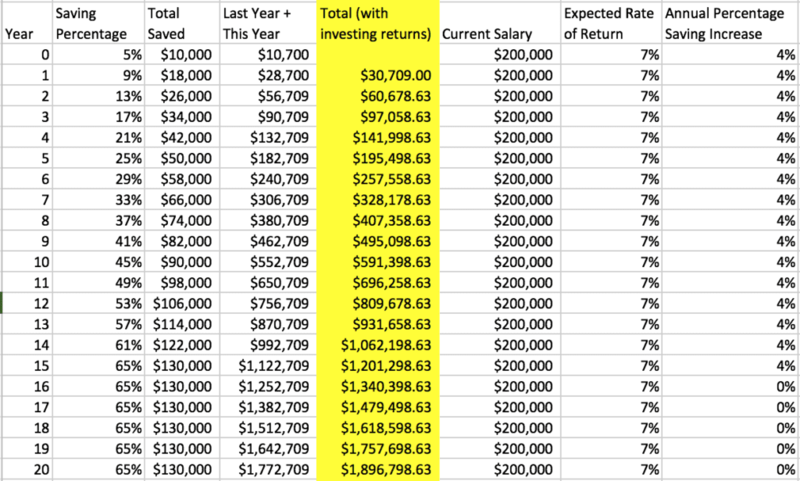 Let’s look at the impact of saving 1% and escalating it every 3 months starting at 5% (“trust me you won’t feel it!”) for someone making $50,000, $100,000 and $200,000. This means in 5 years, if you start at 5% of your income, and follow a version of the 1% early retirement strategy, you will be saving 25% of your income in 5 years. The more you can push it the earlier you can retire. Here is the scenario played out over the period of 20 years, with the saving rate peaking at 65%. The 1% escalation every 3 months really adds up! Check out this calculator I built do run your own scenarios. $50,000 (with 1% escalations every 3 months, peaking at 65% savings rate) = $474,199.66 saved! $100,000 (with 1% escalations every 3 months, peaking at 65% savings rate) = $948,399 saved! $200,000 (with 1% escalations every 3 months, peaking at 65% savings rate) = $1,896,798 saved! Not a bad idea at all thinking about it like that. I already put any raises from work directly back into my 401k by increasing the percentage. Same ideology behind it. I won’t feel it and it will help down the line with compounding. Looking forward to the 1% calculator. Thanks DD. The calculator should be live by Monday! Very helpful and useful information. When you look at money as just money it’s much harder to save and earn more. Putting it into a percentage really allows you to have a big picture view on everything. Another tip we use to help us save more is viewing the price of an item as time. How much time do we have to work to go out and have that nice $50 dinner together? Is it really worth it or should we stay home tonight and cook ourselves for $5. It’s all about a change in mindset and getting the most value out of your dollar at all times. Totally. I love the life energy price calculation! Interesting approach! I like the idea of approaching from percentages because you can really see how much money you’re wasting on silly crap. For example, my car payment used to eat up 30% of my monthly income (I didn’t make much). By eliminating that car payment, I was left with that extra 30% to put into a retirement savings account. Nice! And thinking about it as 30% instead of saying just $60, likely helped you make the decision! Win win. Right now, my savings rate is roughly 50% of my gross income. I consider my savings rate to be inclusive of cash savings, equity build (through mortgage) and investments (pre or post tax). I’d love to push it towards 60%, and I think I will by increasing my income (up for promotion). That being said, cutting expenses is always a reasonable thing to do and to your point, investing more and more each month makes a lot of sense! I’m trying to find the optimal level for my cash balance, I’m contributing 13% to my 401k, but definitely could go higher. At the same time, I like seeing a cash surplus in and my cash account grow in case of emergency. Interesting how you include the equity build in your savings rate calculation. I hadn’t though of that. Do you include investment growth in your savings rate calculation as well? I agree that making more money is more important than frugality since it should give most people more of a surplus to invest. When you consciously invest at least 90% of every raise, bonus, and your side hustle income it really compounds quickly. Thanks for sharing Erik. I especially like your advice on making sure that you’re saving an amount that is comfortable for your individual situation. Also, the concept of viewing the things I buy as a percent is brilliant. There’s a lot of time where I don’t care about spending an extra few dollars but thinking about it as a percent will change that. In regards to my saving, including my employer share purchase plan, I am saving an average of 12 to 15% on average. I plan on slowly increasing this rate over time in small percentage increments. Thanks Graham. Yeah, percentage thinking totally changed my mindset. It’s a lot easier for our minds to conceptualize and understand percentages, but oddly not dollar figures. Many people feel similarly about a 20% discount, but not everyone feels the same about a $100 price difference. It’s all relative and thinking about percentages, even as I make more money, helps me save and make more money. Mmm those spreadsheets are beau-ti-ful sir! 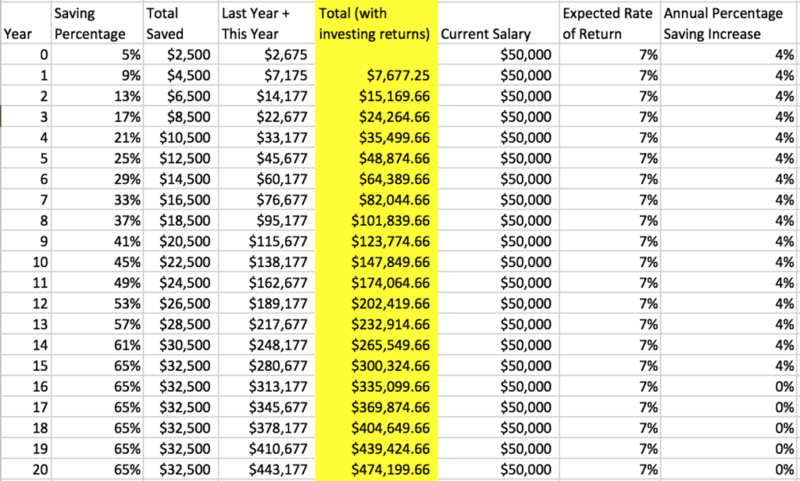 Is a 7% average rate of return typical? Does the sheet count inflation? Our savings rate is like Erik’s above, 50% of gross which I think is as bare boned as one can get – anymore we would be wearing tattered clothes! Thanks Lily! This doesn’t count inflation, but I am working on a calculator version that will! 50% is super impressive. We like to use raises to increase 401k contributions so we don’t even see the change in the paycheck. Out of sight, out of mind and no life style inflation!